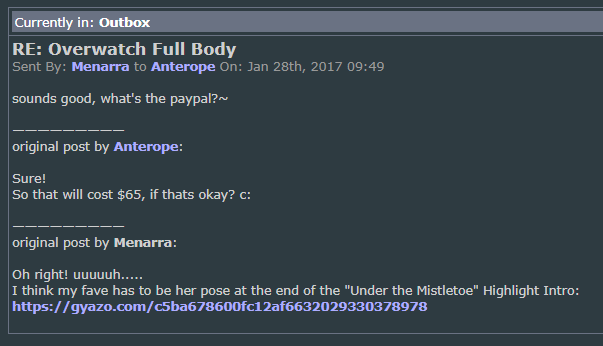 Artist Beware: Anterope - "Artists Beware"
WHEN: I first messaged them on January 28th, 2017. We have been in infrequent communication since then. 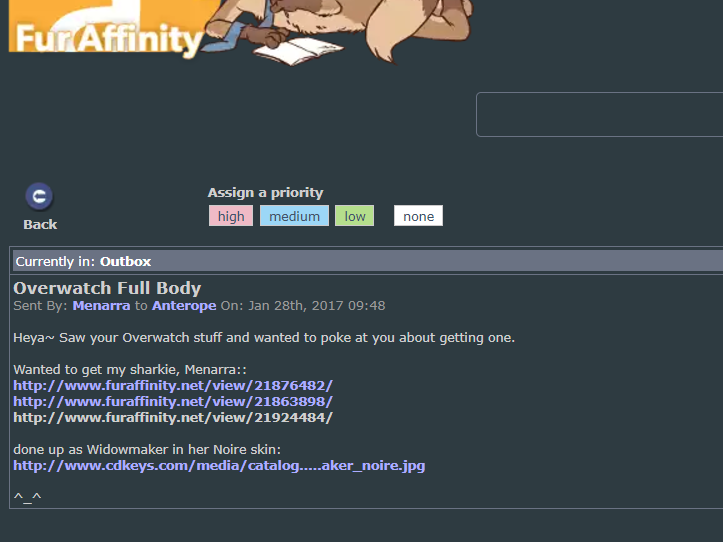 EXPLAIN: I have an abundance of patience for commission artists, I've waited over a year for art before, but this entire situation just feels entirely off. 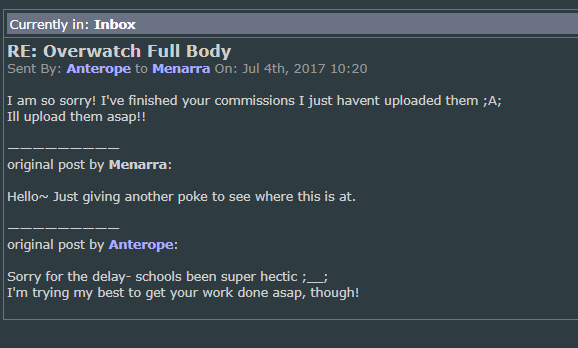 In addition, I've gotten no WIP's ever from them, and nothing but vague/unbelieveable excuses, including "oh I finished your piece and completely forgot to upload it, I'll do so asap!" followed now by over a month with nothing delivered. This says to me they're lieing and likely have done no work at all on the piece. If they'd been up front and honest with me, I probably would have remained patient and waited so long as some WIP screenshots came along, but there has been nothing and I have issued a chargeback request to PayPal to get the money back and take it to another artist to do the piece instead. 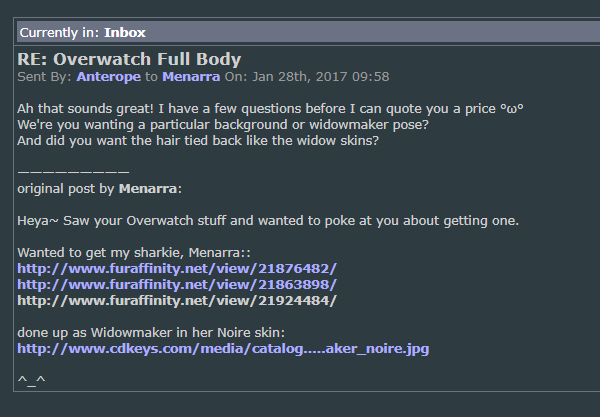 They have barely posted any art at all since offering those Overwatch commissions, and I'm inclined to believe that I am probably not the only person who's been let down. Howdy! We've gone ahead and approved this post, but I'll be sending you a PM momentarily regarding a couple fixes that we didn't feel were worth the extra rejection. Very suspicious. 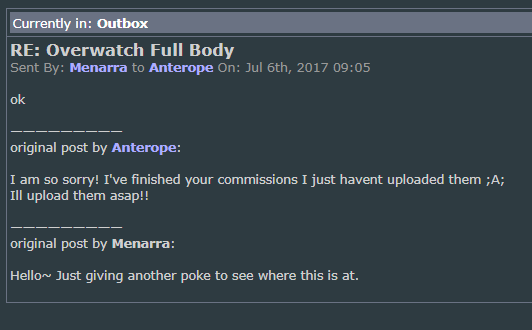 I personally wouldn't be able to commission an artist that doesn't send even one WIP. Watched my mate get too many commissions with errors to honestly do that to a paying client. 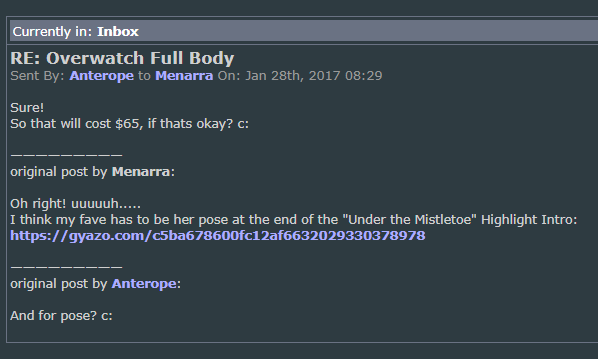 It's concerning that they're underage and taking commissions. 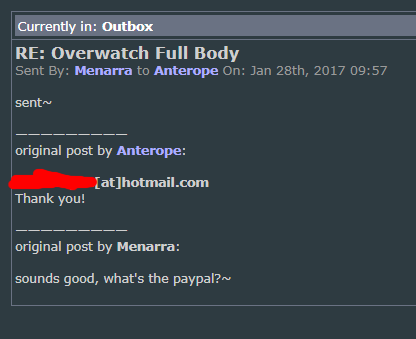 Unless the paypal account in question isn't that of the artist. Right!? For one thing, the client has to approve the final image before I post it anywhere, not only to be sure that they get the image but also as a nice gesture that the one who has paid me sees the image before anyone else. It looks so trashy to send them a link like, "Oh right, that pic is done. Guess you should know." Just to play devil's advocate - I'm an artist myself and I often either don't upload a finished commission to my gallery until days or weeks have passed, or sometimes don't upload it at all depending upon the content. Since there are optimal times to upload to gain the maximum effect, rather than just immediately uploading as soon as it's finished, it's easy to let a finished image sit on my hard drive for a while before I remember or decide to upload it. What I DO do is alert the client as soon as it's finished by email and send them the files/ensure it's approved and finished in their opinion as well as mine. But that should go without saying. 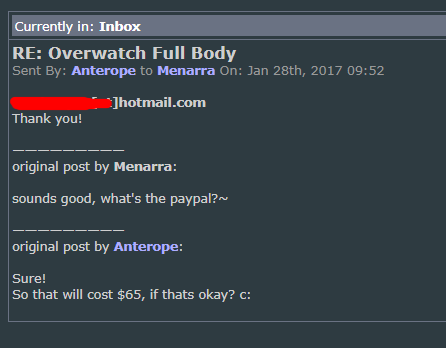 :P I'm just commenting about this because I will sometimes have clients be surprised that I don't upload their commission ASAP when that shouldn't be assumed as part of the deal. Uploading to a gallery and sending the client the files are two different levels of urgency in my opinion.